Northwest United is proud to be an Adidas partner! all our players and coaches are part of the Adidas family, and the brand helps us represent our red, black and green colors! We are also very lucky to have Soccer City help provide orders and apparel for our club! For the 2018-2019 season, the club will be entering a new uniform cycle. Our uniform cycle changes every two years, and with the quality of Adidas uniform, it means they will last! See below for the breakdown of what players will be required to wear next season. 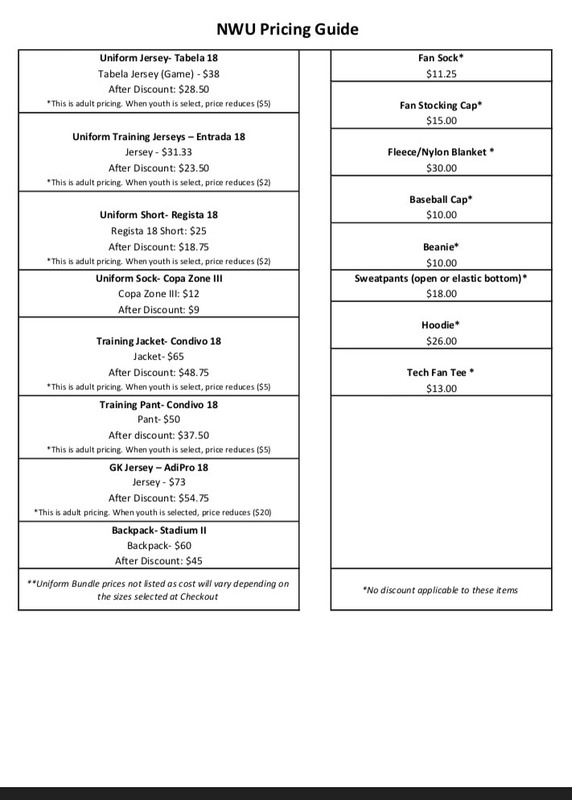 Prices are shown below for both required and individual items. Northwest United is Proud to Partner with Soccer City for All Our Soccer Needs! Soccer City help provide all of our club uniform and apparel. As well as the required uniform above, you can also order a number of additional items for players, as well as parents and families! Hats, hoodies, blankets and other training items can be found on the Soccer City website under youth clubs and NWU.